Don’t ask about the yeast. Ok, I would ask about it. 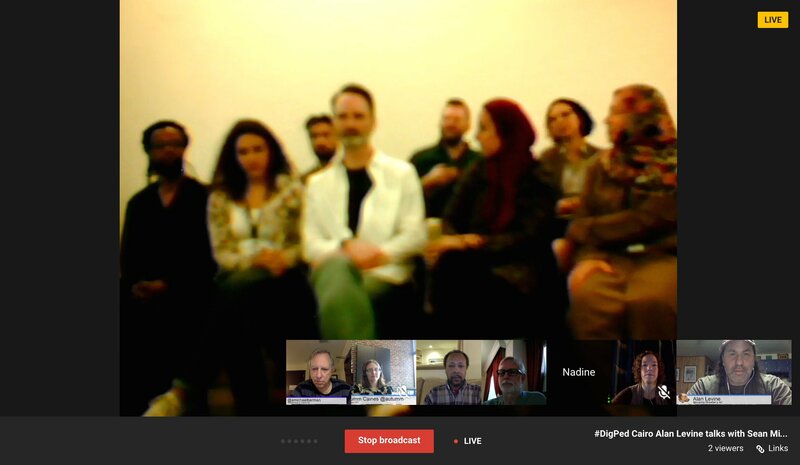 I was awake at 5:30am today to turn on the lights for the Google Hangout session with folks at the Digital Pedagogy Lab Cairo held at the American University Cairo (AUC). In the warm up time before the hangout goes live, the virtual buddies who log on early to check connections etc, end up having a bit of fun chit chat. Michael Berman was apologizing for some poor wifi connectivity at a hotel in Davis, California, and was sharing about his visit, making a reference to the winery program. Michael was going on about what he learned about yeast… and I joked that yeast might come up in the middle of our session, and we would be the only ones to laugh. Enough yeast! Besides Michael, our virtual buddies included Autumm Caines (from Columbus), George Station (first time George and I were synchronous), Mark Johnstone (from Doha), and Susan Adams (from Portland, and new to VConnecting she is on fire in her excitement). 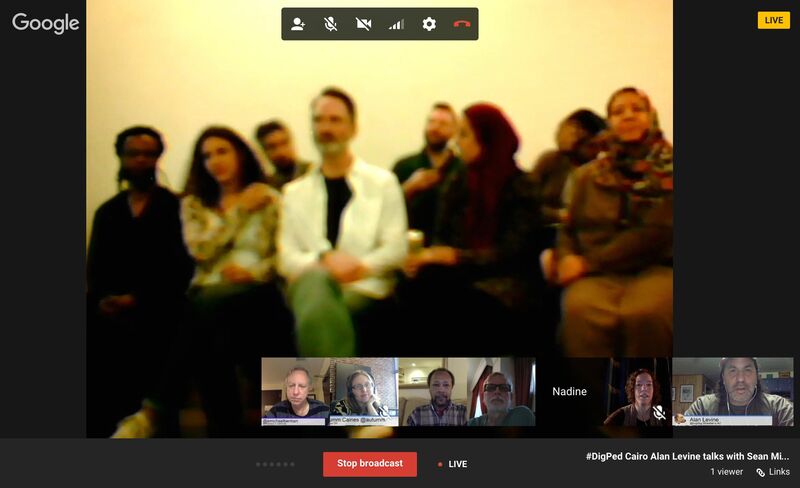 As you can see a screen capture, there was an even larger group in Cairo. For some reason the camera was really blurry, but the audio was really clear (thanks for using a wireless mic). I might miss some folks, but if I recall, from left to right, that is Jose (originally from Mozambique, now at ?? AUC?? ), Nadine Aboulmagd (our onsite buddy from AUC), in the back is Dimitris Tzouris (from Greece, who I’ve known online back to the ds106 era but never talked to live), Sean Michael Morris (facilitator/participant from Hybrid Pedagogy), David Wrisley (from Beirut I think), Maha Bali (head turned, everyone knows her), ??? in the back I forget her name (Sorry), and Maha Abdelmoneim (AUC and frequent VConnector). As host, I try to always toss in a surprise question for the round of intros; for today’s session I asked the virtual buddies to tell us who they are, from where, what they do, and… the closest they have been to Egypt (as it turns out George wins; while in the Navy he visited Alexandria). For the folks in Cairo, I asked them to do the same but tell us the closes they have been to one of the places the Virtual buddies are from. Today was actually a one day post-Institute unconference, so we got some updates on how the format worked and things that stood out for people. They used an open Google Doc to propose the sessions and apparently each session recorded some outcomes/notes from their sessions, so there is a pretty good record of went on. Sean noted it was valuable to have the unconference at the end, as there was much discussion and idea sharing in the institute, and this was a good way to put some of them into practice (or is it praxis?) before people left. Bonnie spoke about how being networked has “changed her mind”. I am curious if anyone had that experience – that in fact they changed their mind about something? And we heard a lot of affirmation for mind changes. George (who amused me with an Arnold Horshack reference) asked about how to carry the collaboration forward- with some discussion following about networking, and how things happen across modes and spaces. More than one person in Cairo described their surprise that Autumm was actually in the US during the Institute, because they said her presence was so strong that they felt like she was in Cairo (Susan too, as I think she was in all VConnecting sessions). Okay those are notes I have from the chat… I’m fuzzy on the rest. The group in Cairo had to go, but I was glad that George, Mark, and Susan wanted to stay on and keep the conversation going. Susan wanted some tips to help her address the conservative approach to teach at her institution. That’s the thing, with people I have a long experience being connected to, virtually and sometimes eventually in person, that moment we met each other blurs into the distance horizon. And this leads me to another thought- it seems like in our field there is this desire to go big, to scale, to teach hundreds of thousands, to affect an entire sector. Scale at the dimension is really only achieved by a process of mass duplication where the level of heart-felt connectivity is probably low. But here, in the span of less than an hour, we had a rich personal connection among many people. I met for the first time Jose, Nadine, David, Susan, Mark — I reinforced past (asynchronous) connections with George and Dimitris, Sean who I met briefly at MLA, and then I amplify the ones with people I have connected before- Autumm, Michael, both Mahas. Not massive in numbers, but massively effective in growing strong(er) personal/professional/blurred connections. It keeps rising. Like yeast. Top / Featured Image: A screen capture I got in the middle of today’s Virtual Connecting hangout, from the full archive video on YouTube.